Discussion in 'Reviews' started by xcel, Feb 6, 2013. A tale of two hybrid vehicles… The nice C-MAX and the evil one. 2013 Ford C-MAX - $25,995 to start including destination and handling and a 41/37/39 (forget the EPA figures) mpgUS city/highway/combined rating. 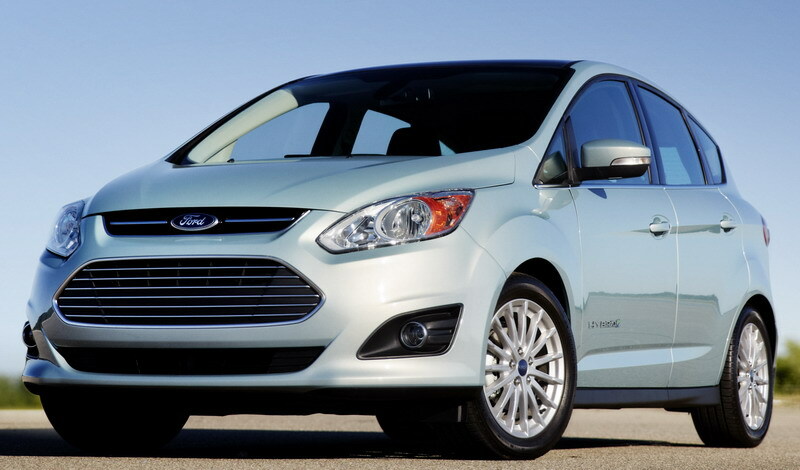 Los Angeles, CA -- The all-new 2013 Ford C-MAX made its mark on the American roadway well before its actual arrival. With an EPA figure that was quite literally the same as a Prius liftback at 47 mpgUS (city/highway/combined), but also larger and what appeared to be a much more modern interpretation of the hybrid automobile as we know it today. With a few hundred miles behind the windscreen, it proved to be capable of great feats while also being one of the most frustrating drives from the point of view of the average consumers fuel economy expectations. This arroused the Jekyll and Hyde nature of this all-new car called C-MAX. 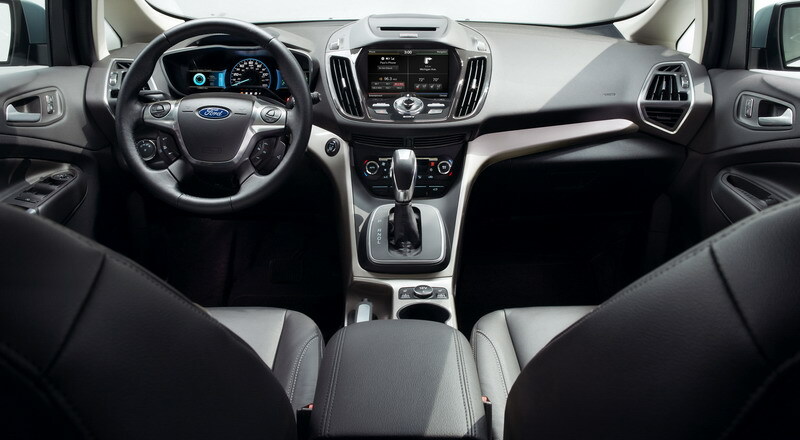 The C-MAX Hybrid is derived from Ford’s European C-segment platform with the company’s latest and efficient atkinsonized 2.0L and hybrid drive system providing propulsion. It was the first application of the brands global C-car platform when it was released in Europe as a non-hybrid back in late 2010. It now underpins the companies C segment offerings globally including the entire Focus lineup here in North America. In terms of small CUV like wagon competitors, there really is only one. The 42 mpgUS combined rated Toyota Prius v.
The 2013 Ford C-MAX Hybrid is available in two trims, the SE and SEL plus a 21-mile all-electric range rated plug-in variant called the Energi. Complete specifications, pricing, standard, and optional equipment for the 2013 C-MAX Hybrid can be found within the 2013 C-MAX Hybrid Specifications page. 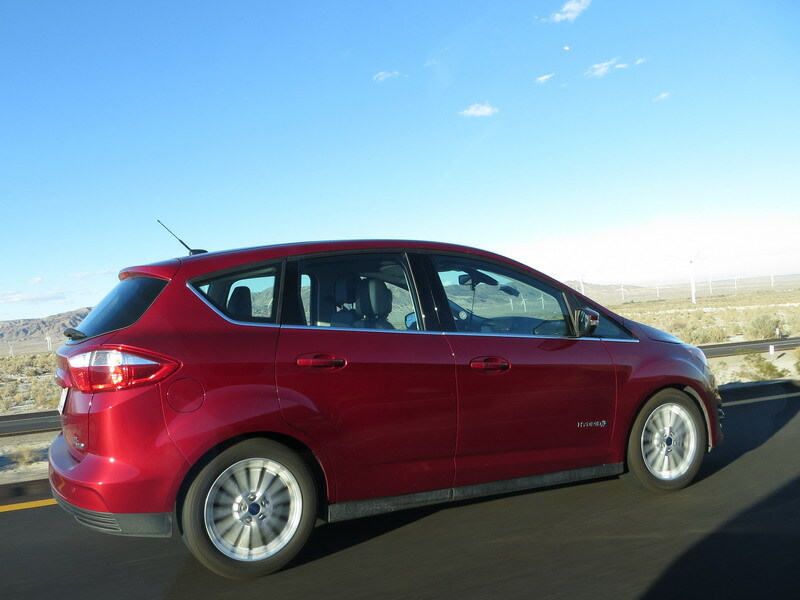 Ford’s ‘kinetic design’ is alive and well on the C-MAX Hybrid. Up front you have the standard Aston Martin’esque like gaping lower front grille work trimmed with a chrome bezel and chromed slats. There are two pairs of hood creases. One set beginning at the top outward position near the A-pillar and working their way down towards the nose while directing your eyes to the Ford emblem placed centrally within the single bar top inlet. The second more prominent set actually runs around the entire length of the car as it is wrapped around through the rear roof spoiler edge, follows the roof line and continues down the A-pillar ending with a three dimensional cutout as they eventually surround the top and bottom of the large front wraparound headlight lenses. The silhouette features a rising chrome trimmed belt-line curving upwards at the rear through the D-pillar and towards the prominent and standard rear spoiler. A deeply accentuated character line beginning at the top of the prominent front fender flares runs through both body colored door handles and fades into the large rear wraparound taillight lenses. A prominent sculpted feature line just above the wrap around all-black rocker panel molding gives the profile even more depth with the luxurious looking 17 in alloy wheels adding a touch of class at no extra charge even on the base SE model. To the rear, the C-MAX includes a prominent horizontal feature line through the rear lenses that bows outward providing depth where there usually is none. Another feature line pulls away from the lower lenses and ending at the license plate cutout. While the rear does not quite have the same dramatic appeal as the nose or profile, it is much better than most minivans out back. All together, the exterior shape provides a Coefficient of Drag (Cd) of 0.30. Ford's Kinetic design language used to describe the exterior is present inside as well. The vast soft-touch slush-molded upper instrument panel (IP) provides the feeling of being large and open but it is mostly unusable space in front of both the driver and passenger. A leather wrapped wheel with audio controls and shift knob is standard on both the SE and SEL providing an upscale look and feel although the raised stitching caused some discomfort to my inner fingers when gripping the wheel tightly. The centrally located speedometer is bordered by both the right and left dual 4.2 in LCD based SmartGauge with EcoGuide displays (rather beautiful displays if I do say so myself), all housed in a hooded pod with a chrome like bright plastic trim. The central display of the SEL housed the 8 in LCD touchscreen with SYNC, MyFord Touch and the SONY brand logo all surrounded by a non distinct reflective plastic surface. The large display itself was notable as it could be viewed in direct sunlight without eye strain. Below the large central display is the lower HVAC controls with bright trimmed and tactile knobs and large mimics on the push buttons. A very tall driving position gives a commanding feel over the road while the 10-way power adjustable driver seat gave plenty of adjustment. The seat bolsters seemed a bit confining after 2 or more hours in the seat. A great addition to the C-MAX was its 4-way adjustable front seat headrests. An up and down movement of an uncomfortably positioned headrest does nothing but frustrate. The C-MAX however has a swivel mechanism allowing not only up and down but back to front motion providing everyone what they want while still giving the IIHS and NHTSA the geometry they expect for high crash test scores. These two do come into conflict with one another and the C-MAX provided one of the best solutions I have driven this side of a $35,000 price tag. To the rear, the C-MAX includes a 60/40 Split Forward Fold Flat rear seat that provides 24.5 cu. ft. of cargo capacity in the upright position. 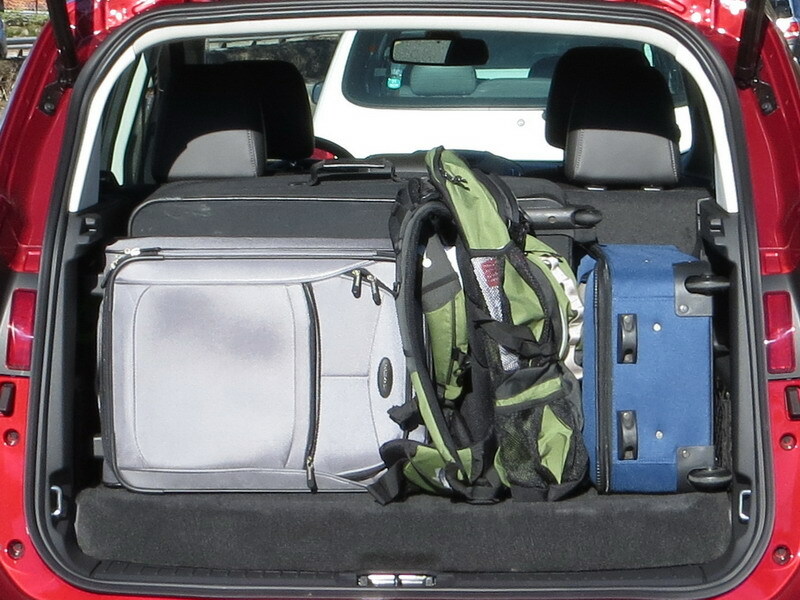 While the tall roof may allow that volume to be stowed, in practical terms, the hatch to rear seat length was far too short for even a large suitcase to fit longitudinally. The full-color 8 in display houses the Bluetooth HandsFreeLink phone interface, Navigation system display, Audio display and interior climate control display laid out in four distinct quadrants. I had a hell of a time pairing and holding sync with my older Motorola RAZR although the latest smartphones pair right up. Sound emitting from the optional XMSirius or HD FM radio was clean up to lower midlevel volume which is about the maximum level I listen. Only the smallish icons were a hindrance to tap without distraction when using the touchscreen controls. Attempting to use SYNC to control these functions other than my non-pairable phone was a lesson in futility which would probably become a non-event with more time behind the wheel and using the system. The C-MAX is powered by a very powerful atkinsonized 2.0L mated to Ford latest generation eCVT or powersplit hybrid drivetrain connected to an air cooled 1.4 kWh Li-Ion battery pack providing a total system output of 188 hp. When you punch the go-pedal, it moves. As in a 0 to 60 time of just 8.6 seconds which is surprisingly quick for a midsize high fuel economy family hybrid. Where customer satisfaction is going to head into the toilet however is its 47 mpgUS city/highway/combined rating. Although that number can be decimated, when driving like the rest of the world, owners are going to be extremely disappointed that the upper 30’s is all it will provide. Given the C-MAX sits on a slightly modified Focus platform, it handles well. The chassis design of the C-MAX consists of 53 percent high strength steel providing a rigid platform to attach the suspension pieces too. MacPherson struts up front and a ‘Control Blade’ multilink rear suspension with a semi-isolated front subframe take care of the rock and the roll. Together the C-MAX provides a compliant yet confident flat handling ride as you navigate fast sweepers when driving down out of the mountains. For such an upright vehicle, I was actually surprised at how well it did handle with far less wallowing than expected. The new electric power-assisted steering (EPAS) is light where it is supposed to be and firms up quickly as speed increases while the quick steering ratio rack creates a more responsive and direct road feel. There was essentially no crosswinds during the multiple hundreds of miles of driving to test its comfort capability in that situation so maybe the next time around? The C-MAX was also reasonably quiet showing that while it weighs a ton (SE weighs in at 3,607 pounds), that extra weight provides a lot of Noise, Vibration and Harshness (NVH) isolation. Particular attention to provide NVH isolation from the front and rear quarters appears to have been completed with a new type of foam-backed heavy layer carpet, self expanding foams in the body cavities, and an acoustically optimized dash isolation in addition to sealing trim parts. Altogether the Ford designers and engineers did a very good job in this respect. The 2013 C-MAX has not yet been tested by the IIHS including the new nasty small overlap test. The NHTSA has and the C-MAX scored 4 of 5 stars overall. It arrives with all of the very latest in active and passive safety features. On the active front, Ford’s Electronic Stability Control (ESC) includes Anti Lock Brakes (ABS), Electronic Brakeforce Distribution (EBD), Emergency Brake Assist (EBA), Curve Control (CC), Torque Vectoring Control (TVC), Traction Control (TC) and Brake Override. Passively when the worst occurs, the C-MAXs standard, high-strength and ultra high strength steel body deforms in such a way to minimize impact forces for occupants. 7 airbags including the driver and passenger front, side and side curtains along with a driver’s side knee airbag are standard. Post crash the SOS Post-Crash Alert System takes over and unlocks the doors, flashes the hazards and sounds horn after airbag deployment or safety belt pretensioner activation. As hinted above, this is the area where the C-MAXs Jekyll and Hyde personality arises. Escaping LA with heavy stop and go traffic on the I-405 and I-5 the C-MAX was in its element providing a reasonably good overall result of 63.8 mpg as shown below. 63.8 mpgUS actual (after the actual aFCD and odometer offsets as calculated during the long drive test below are applied) over a 103.0 mile drive from LA to San Diego. When driving at an actual average speed of 66 mph from San Diego, CA to Phoenix, AZ, the C-MAX Fuel Economy failed to come anywhere near its EPA ratings let alone expectations. 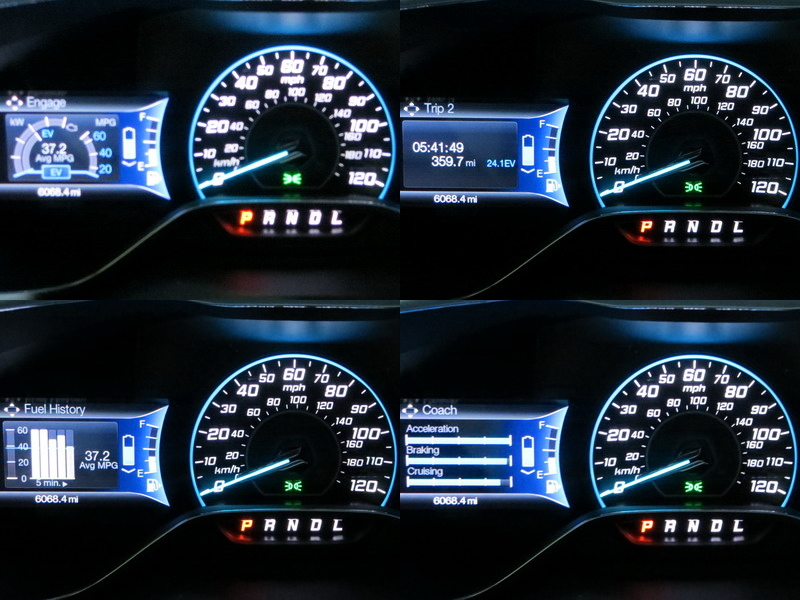 The C-MAX was left booted up on a number of stops to snap pics thus the 64.2 mph average speed as calculated vs. the 66 mph average actual shown below. San Diego to Phoenix, AZ. Google Map route of 365.0 miles. 37.2 mpg and 359.7 miles displayed. 10.271 gallons consumed over 365.0 actual miles traveled = 35.537 mpgUS. 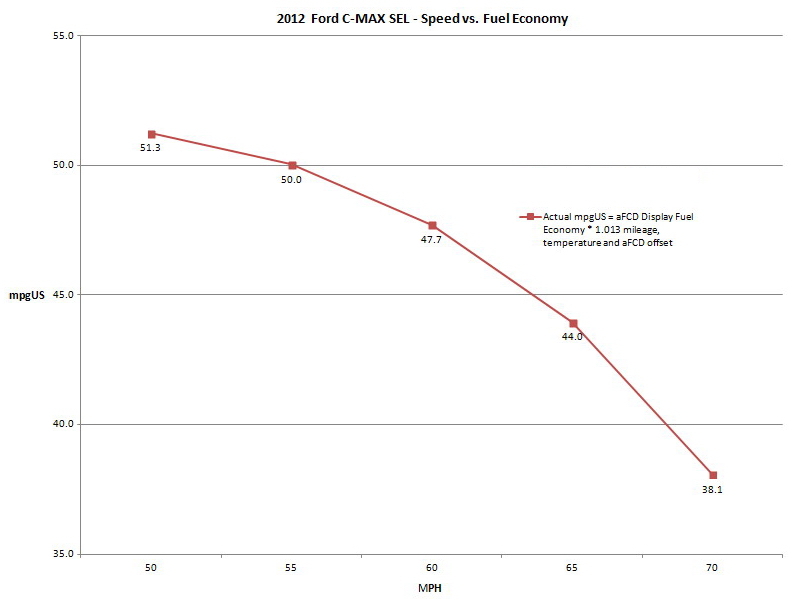 The C-MAX calibrated Speed vs. Fuel Economy graph above provides more evidence that the average driver striving for 47 mpg is going to have a real tough time of it. We have never driven a vehicle whose steady state EPA highway rating was not blasted out of the water at 60 mph whereas the C-MAX barely made it. 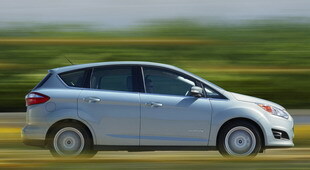 In many cases, vehicles are breaking their EPA highway at 70 mph where the C-MAX Hybrid has fallen short by almost 20%! From the initial drive, the C-MAX felt quick, handled well, provided good ride comfort and its interior appointments appear to be a class above. The C-MAXs optional power liftgate with foot-activated control is priceless for those times when your hands are full and you need to open the rear hatch. This first impression is what will bring new customers to the Ford brand. Less expensive feeling left and right control stalks and the compromised rear cargo capacity were disappointments and will be discovered over time. With the ability to achieve > 60 mpg in its zone (heavy traffic between LA and San Diego), the C-MAX gave me hope that the average driver would achieve 45 + mpg when driving their own daily grind we all experience day to day. Unfortunately the higher speed long distance all-highway drive and the subsequent speed vs. fuel economy graph revealed an entirely different C-MAX by comparison to its first drive. The poor level of fuel economy compared to Ford’s own EPA ratings will surely create disappointment and frustration from those that thought 47 mpg was going to be a given when in actuality, 38 to 39 mpg will more than likely be the norm. On this same route, a competitor not only beat its EPA highway figure by a significant margin but beat the much higher rated C-MAX Hybrid as well! In other words, the 2013 C-MAX Hybrid would be a really nice car for a good price "if" it was rated at a more realistic 41/37/39 mpgUS city/highway/combined figure. Given future owners expectations of a triple 47 mpg rating and the ease at which it is supposed to beat its main competitor's fuel economy ratings and range due in part to thousands of hours of online and over the air ads, there are going to be a lot of disappointed owners. All-in, the Engineering Calibrators and Marketing execs simply got too far out ahead of the curve and missed the ball entirely… Leaving customers and their expectations hung out to dry. Too bad as it is a nice hybrid otherwise. 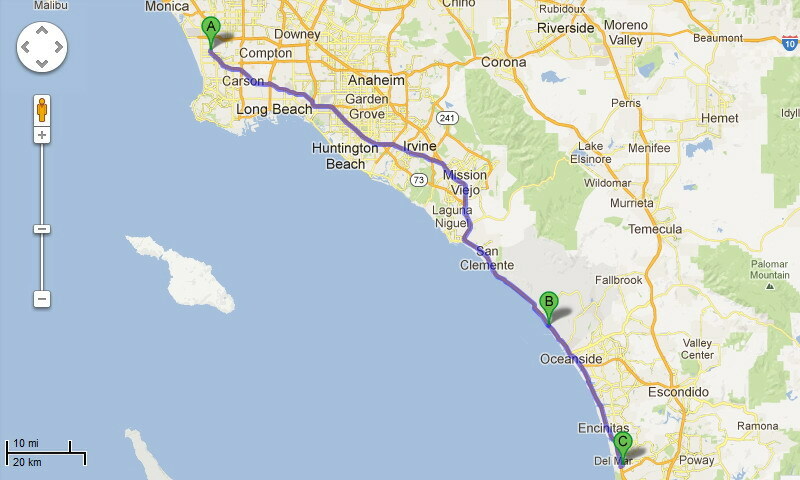 That LA to AZ run that got 35mpg is about 20 mpg lower then what I got from LA to Vegas. I was going 65-75mph on CC and got 54mpg. My C is rated at 46mpg HWY?? Why is so under rated LOL??? I remember that the chief engineer for the C in the San Diego press conference was upset about that and felt that it was underrated. I wounder what the real EPA rating should be on the C? Hi Wayne, thanks for the great review. 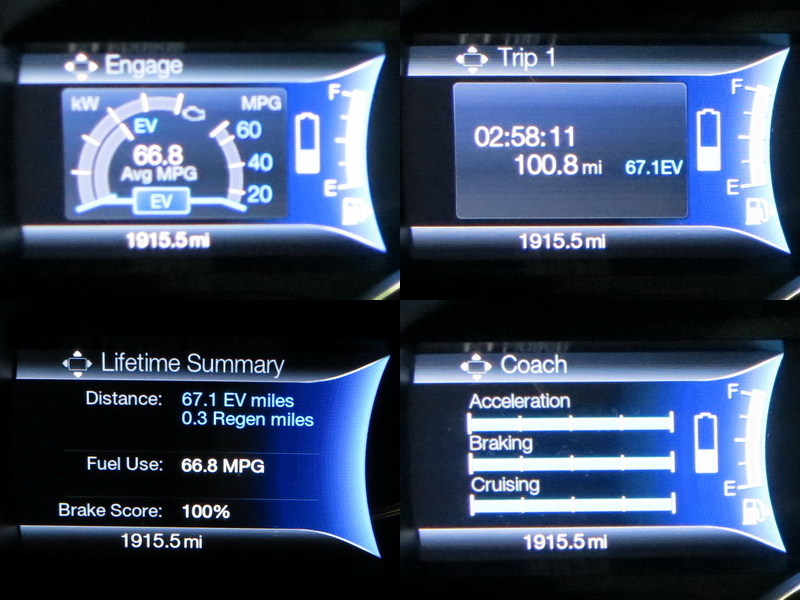 Out of curiosity have you spoken with any of the Ford people about the mileage after your time with the C-MAX? My last tank in the cold was 34 mpg. The Fiesta has a good growing trend.. I'm pretty disappointed in the trunk size of the C-Max. Although larger than the Prius Liftback in volume, the cargo floor of the C-Max is actually smaller, at just 31" long compared to the Prius' 34.5" (and, heck, the Focus' 33"). Again, I'm comparing to the "lowly" liftback Prius, not to the Prius V with which the C-Max is trying to compete. The Prius V's cargo floor is 36" long with the rear seats all the way back, and can be extended quite a bit longer by sliding them forward while still allowing their use. In fairness, the Prius' cargo hold is height-challenged enough that the C-Max may be marginally better at carrying a family's luggage -- but only marginally so. Basically I can't envision a situation where I'd buy a C-Max. It costs as much as the Prius V and doesn't beat it in mpg. And it's barely bigger than a Prius liftback that costs $3k less and blows its fuel economy doors off. I'm glad it is in the market -- competition is good, and many people will buy it for the Ford nameplate, the unPrius looks, the upscale interior or the handling -- but it seems Toyota has them beat on the attributes I actually care about. To summarize - - Apparently the C-max ain't bad, other than being overweight, overpowered, thirsty, too short in the cargo hold for bikes, and (imho) uncommonly homely. You forgot reliability, Ford vs the everlasting Prius.. which one is easier for old geezers to get in-out?, long trip comfort? Wait, but it looks like you had to fold down BOTH rear seatbacks to do it. I need to be able to transport a bike with my child seated in one of the rear seats (on the 40% side), and the other (60%) seatback folded down. I can do that in an Insight or Prius Liftback, but it starts getting difficult once the load floor approaches 30" long or less. Not being able to do that = fail in my book. I don't own one, but considering the Energi along with the Volt. I want to throw a bike in the back with no rear passengers. Looks like either will work for that. We would use a rear carrier for traveling with luggage and two bikes. Also I tested a PIP, but short EV range and the worst steering I have experienced in 30 years disqualified it. And the two option choices with huge price delta are poor. Disappointing. But looks pretty good otherwise. Fix the mileage ratings, or have the EPA "spot check" it, and price it more competitively with the Prius V and they'll have a hit. As a prospective Mazda5 buyer, it's too bad they didn't have a hybridized 5, basically, with a 3rd row of seats. Just received a note from a friend on FB about his sons C-MAX. My son stationed in El Paso just had the battery on his week old C-Max give out. Strangely enough, they haven't figured out what to do about it. Is there a contact person at Ford for Hybrid problems? I posted that the Ford service dept. will (should) handle things promptly. Anyone here of any problems like this with the C-MAX or C-MAX Energi?